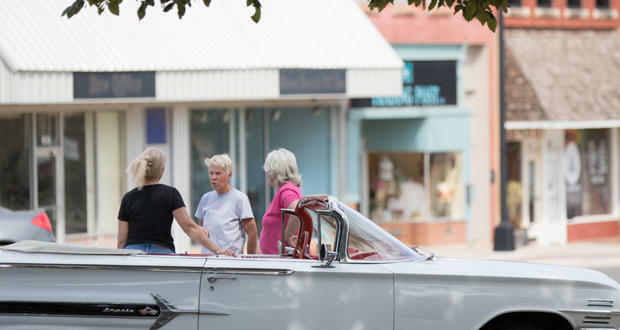 Three women chat in front of business storefronts in downtown Perry. State legislators hosted an interim study on Wednesday to evaluate what’s hindering businesses from locating in rural Oklahoma. Business recruiters in Oklahoma say they need more tools to help attract companies to the state. At a House interim study on Wednesday, economic development leaders indicated Oklahoma is losing out to other states because Oklahoma does not have a robust closing fund to help seal deals. A closing fund is state-appropriated money that can be used at the last minute to entice a company to set up shop. Journal Record reporter Molly Fleming talks with KGOU's Jacob McCleland. An Oklahoma Department of Commerce public information officer said at one time the fund had $9 million, but it is now down to $1.8 million. In Arkansas this year, the Legislature budgeted for $50 million in its closing fund. “If there was more money in the closing fund, we would win more projects,” said Jon Chiappe, director of research and economic analysis for the Commerce Department. He said projects that have used money from the closing fund are the Macy’s Fulfillment Center in Owasso and the GE Oil and Gas Technology Center in Oklahoma City. Macy’s used the money to cover training costs and GE used it for infrastructure. The Department of Commerce took $1.6 million from its revolving fund last year and placed it in the state’s closing fund, Fleming says. “If you think about it, if you have two friends that invite you for dinner, if one invites to pay for the meal, which friend would you choose? The closing fund money can really make a difference at the wire,” Fleming said. Arkansas, with a $50 million closing fund, is competing with Oklahoma for businesses. Additionally, Lyle Roggow, president of the Duncan Area Economic Development Foundation, told the panel he lost several projects to Mississippi over incentives, “which no one wanted to hear about because the Magnolia State is often listed as having a worse education system than Oklahoma's,” Fleming said. McCleland: This is the Business Intelligence Report, a weekly conversation about business news in Oklahoma. I'm Jacob McCleland. I'm talking today with journaled record reporter Molly Fleming. Molly thank you for joining us again. Fleming: Hey thanks for having me. McCleland: Now Molly I want to talk to you today about efforts to attract new businesses to Oklahoma and the tools that recruiters have available to them here. You wrote in your newspaper this week that businesses are saying no to Oklahoma because other states can offer more closing funds. Closing funds our state appropriated dollars that recruiters can offer to push a deal across the finish line, so to speak. Is this a case of Oklahoma's closing funds simply drying up because the state doesn't have that money. Fleming: That seems to be the situation, though 1.6 million dollars was put into the fund last year from the Department of Commerce's revolving and fun but the fund is only $1.8 million, so simple math will tell you there wasn't much in the fund to begin with. McCleland: So so which states are losing businesses too? Fleming: Mississippi was named as one which no one wanted to hear about because the Magnolia State is often listed as having a worse education system than Oklahoma's. But Mississippi has $450 million in bonds it can use for business recruitment. So the fund this closing fund was actually discussed Wednesday at the Oklahoma House of Representatives interim study and they were looking at how to bring more economic development to rural Oklahoma. So it really got into how do we recruit business to begin with. The Department of Commerce mentioned Arkansas as a threat. They are really watching Arkansas because it's the natural state now has $50 million in its closing fund. McCleland: You know incentives are kind of a bad word right now at the statehouse. You know, legislators created in incentive review committee to make sure incentives are doing what they're supposed to do. Are there any real efforts to pump some money into the state's closing fund? Fleming: There was last year and there will be this year. State Representative Scott Fetgatter, he's a Republican from Okmulgee. He is one of the members that it is who called for the interim study. He ran a bill in 2017 session to get $5 million in the fund, but the money wasn't approved. So he's going to do a 10 million dollar bill for the fund this year in the 2018 session. And he said he will double it until the money is approved. During the interim session, it was brought up that if Oklahoma had more closing fund money it could get more deals done. So if you think about it, if you have two friends that invite you for dinner if one invites to pay for the meal. Which friend, which friend would you choose. The closing fund money can really make a difference at the wire. McCleland: I understand transportation is a concern for some companies looking to open shop here especially the lack of direct flights to Oklahoma City and Tulsa. Fleming: One representative asked Deputy Secretary Jamie Herrera about this during the study. I didn't expect the answer that she gave and she said yeah this is an issue they hear about "frequently," was her word. People don't like that she has to travel through Houston Dallas or Atlanta to get here. McCleland: So are there any particular tools that recruiters can use to bring companies to rural Oklahoma? Fleming: Yeah the Department of Commerce has development money for towns with populations of 7000 or fewer. Another program is for a city to become a Main Street USA community and most Main Street communities are rural. The department is also working on creating a strategic plan for every county which is a huge task of course. But if you want to recruit business, you need to know what you're after. So the department is going to look at area, natural resources and workforce and then create a plan. McCleland: Now what about education? Did the panelists indicate Oklahoma's education system plays a role in recruiting businesses here? Fleming: Oh yes. That was certainly mentioned especially when we're talking about bringing jobs to rural Oklahoma. Rural population are drying up. And many people who are there have been trained in oil and gas. And so deputy secretary Herrera who sits on the governor's workforce task force said there's an initiative in the works now to try to figure out how to retrain folks. McCleland: Molly Fleming is a reporter with The Journal Record newspaper. As always, thank you so much for talking with us Molly. You're welcome. Fleming: KGOU and the Journal Record collaborate each week on the Business Intelligence Report. You can find this conversation at kgou.org. You can also follow us on social media. We're on Facebook and Twitter @journalrecord and @kgounews. As a community-supported news organization, KGOU relies on contributions from readers and listeners to fulfill its mission of public service to Oklahoma and beyond. Donate online, or by contacting our Membership department. Music provided by Midday Static.